Previously on Mr Selfridge… | Warped Factor - Words in the Key of Geek. 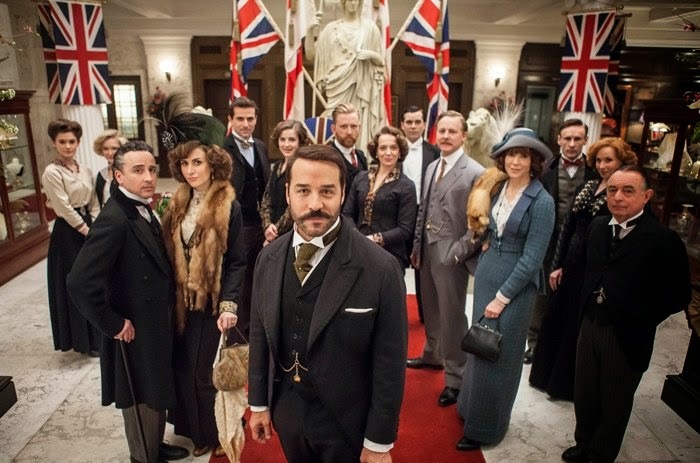 With Season 3 of Mr Selfridge set to air on British TV from Sunday 25th, Tony Fyler gives a lightning walk-through of the first two seasons, should you jump in at the deep end. What’s this? Prime time Sunday night viewing – a thing for geeks? Well, whether Mr Selfridge (and indeed Downton Abbey) classes as a geek-based fandom depends on how you define geekery. Does geekery have to be based in science fiction and fantasy? I’d argue not – it’s any entertainment that fuels an obsessive interest, surely? Does geekery apply only to programmes that aren’t mainstream? Maybe in the past, but not any more – since the days of Buffy The Vampire Slayer, when geek TV went mainstream, there’s little that would not in fact be a candidate for geekery. Star Trek had a mass audience in its Next Generation days too. Doctor Who has certainly crossed over from the fringes to the mainstream. So sure, why not appreciate the geekery inherent in prime-time programming? Mr Selfridge is what happens if you smash The West Wing and Downton Abbey together – but base it in the life of a real historical figure. In this case, that figure is Harry Gordon Selfridge, the American shopkeeper par excellence whose signature store on London’s Oxford Street is the White House of commerce in this story. At the time, during the 1910s, it was the biggest and arguably finest such ‘department store’ in the world. Based on the book Shopping, Seduction and Mr Selfridge by Lindy Woodhead (Selfridge himself saw commerce as a romantic business - how else do we explain that he published his own book and called it The Romance of Commerce? ), and with episodes written by adaptation supremo Andrew Davies (with everything from To Serve Them All My Days, to the Colin Firth/Jennifer Ehle Pride and Prejudice, through the House of Cards Trilogy to Tipping The Velvet under his televisual belt), the combination of period, class, money, glamour and intrigue has all the spirit of a West Wing-style ensemble drama, but set in a Downtonish world with the glamour turned up to 11 and the waspish put-downs dialed right down. The closest we come to dripping poison is Lady Mae Loxley – keep an eye on that one, she grows on you. But really, there isn’t a Dowager Countess in Mr Selfridge – it’s a more fundamentally joyful, optimistic thing than that, with commerce presented as a pathway to success through hard work, rather than the inherited wealth, sniping privilege and gentle bluster of the Downton crowd. So if you’re new to Mr Selfridge, park the expectation of cynicism, and even, to a degree, of wit. Selfridge is played with a straighter presentational bat, but the characterization is more believable than the more stately home show. 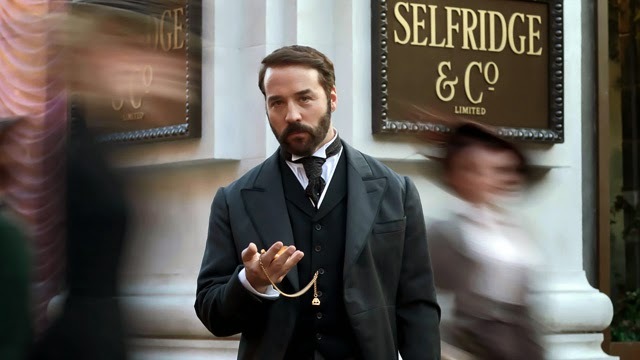 In particular, Jeremy Piven as Mr Selfridge has been both criticized and lauded for his interpretation, which is ebullient and shrewd, showing the contradictions of a family man with a string of mistresses and an almost ever-roving eye. The character’s enthusiasm for life is infectious, and Piven lights up the set by walking through it, spreading a little American egalitarian to an otherwise-stuffy, class-bound British society. Season 1 blends the struggles of Selfridge to establish the store, bringing a commercial Barnum-style flair to the affair, (including special appearances by the likes of Louis Bleriot, Anna Pavlova, Arthur Conan Doyle and Ernest Shackleton), with the personal lives of Selfridge, his wife and chief among his mistresses, stage actress Ellen Love. It also follows threads of life story all the way down the echelons of the store staff – from a growing love triangle between the store’s artistic director, smouldering Frenchman Henri Leclair, young Agnes Towler, accessories assistant, and Victor Colleano, waiter at the Palm Court restaurant, to the shoplifting of senior sales assistant Miss Bunting and its tragic consequences for the extended Selfridge ‘family’, the courting of ambitious assistant Kitty Hawkins by journalist Frank Edwards, and the impact on Agnes – and her brother George, who’s a porter in the same store – when their drunken abusive father comes back to haunt their new lives in the hub of Britain’s commercial world. An almost-dalliance between Rose, Mrs Selfridge, and a passionate young artist, the affair between head of accessories Miss Mardle and the company’s human resources manager Mr Grove, and the aristocratic shenanigans of Mae, Lady Loxley, known for her patronage and the count of her lovers, all add spokes to the drama, meaning the show barrels along with storylines intertwining and reacting together, towards a conclusion that sees Harry Selfridge ridiculed on stage by a play written by snubbed journo Frank, and with his family life in ruins when Rose takes his children back to the States. Season 2 picks up the story in 1914 with the imminence of war, and it changes the dynamic significantly. Many of the Selfridge’s men go to war. The wartime emphasis on family sees the young Master Selfridge, Gordon, begin his learning of the store from the inside out, and brings Rose and the Misses Selfridge back from the US to present a united front. The romantic tension between Agnes, Henri and Victor intensifies when Agnes comes back from Paris, more accomplished in her window dressing and display, and ready to move up the Selfridge’s ladder as head of display. Monsieur Leclair though has issues of his own, with accusations from within the store that question his patriotism and even put him in danger from charges of being a spy. Meanwhile, Selfridge himself is in Germany doing covert work on behalf of the British government! Miss Mardle, heartbroken and hard-done-by at the end of Season 1, gets something of a renaissance when she inherits a large house and an allowance, and Agnes moves in with her. Mr Grove comes close to a nervous breakdown, and has to be pulled back into routine. But with war raging in Europe, Harry Selfridge is called on to help the war effort, and Lord Loxley – Lady Mae’s powerful and objectionable husband, tries to bring him down by using his list of suppliers for government contracts – then taking profit off the top and awarding contracts to shoddy suppliers. As the season moves to its climax, Loxley is found out, Mae aims to leave him, and Rose, Mrs Selfridge, reveals she has a fatal condition. Miss Mardle finds the potential for love with a young violinist, the triangular relationship resolves itself, with Agnes, Victor and Henri going forward together, each with their own stories. While Season 2 is a darker thing than the first run, the issues it tackles delve beneath the strictures of class and show a degree of the impact of war, and how the so-called palaces of commerce acted as beacons of hope in even dark times. And so we head into Season 3, with Rose dying, Agnes and Henri together, and the potential of the 20s to come. If you haven’t got your Edwardian shopping geek on yet – do it now, while stocks last.